Put a metal roof on that low sloped area and slate from there up! I have a porch roof with a about a 2.75:12 slope. I am thinking that I should not use slate on it do to the low slope. 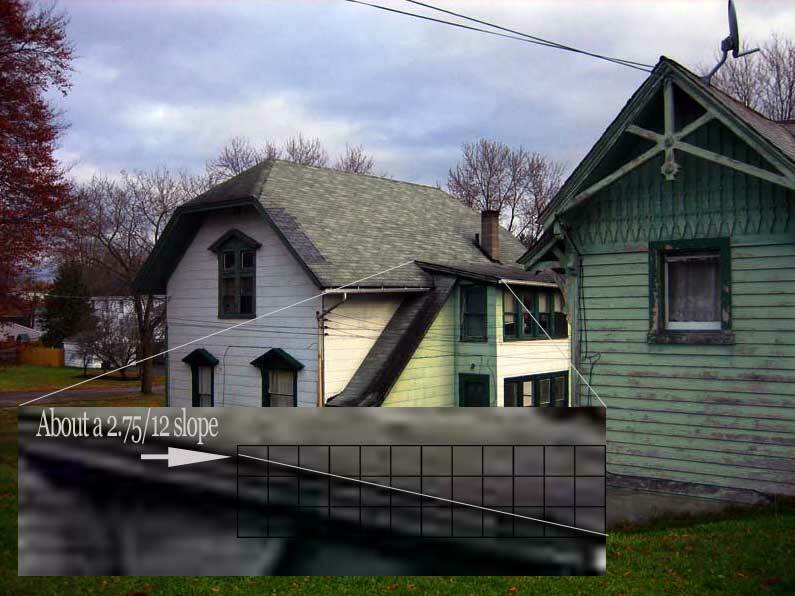 I have a case where some roof slopes are 1:4 or 4" rise to 12" run. What is done in his case using slate roof tiles? Is the headlap increase from 4" to 5"? The headlap should be 4" on a 4:12 sloped slate roof. However, slate roofs always benefit from a steeper slope. Slate roofs should not be walked on, and low slope slate roofs *will* be walked on - guaranteed. If it's a low enough slope to walk on, Bigfoot will be up there sometime over the life of the roof and he will greatly reduce the life of the roof by walking on it and breaking the slates. A good slater *can* walk on a low slope roof and not break it, but it takes experience. So if you can make the roof steeper - too steep to walk on - you'd be far better off. Good slopes for slate are 10:12 or 12:12, although lower and higher slopes work too.